Allison provided a review of EZ Brite Penny Brite copper cookware cleaner. This is a great product for anyone who is looking to keep his or her copper pots looking brand new. I have several copper pots, which I received as a gift from my husband several years ago, and which I love to use while cooking in the kitchen. I have them hanging up so they've got to look good all the time. 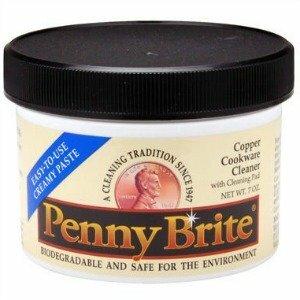 I use the Penny Brite periodically to keep these pots looking their best and to get rid of all the stains and build up that comes with cooking on a stove. I like that I don't have to scrub until my fingers are tired, but instead it works quite well with just some swipes of the cleaning pad and buffing. In addition, it smells pretty good, and works quickly. Thanks so much for sharing your review Allison. I note that this product comes in both a paste and a gel form. I would love to hear from others who've used this product to clean copper or any other metal, to share how it has worked for them. You can share your tips for cleaning copper here, or read others that have already been submitted, including reviews of other copper cleaners. Plus, I've collected lots of tips for cleaning pots and pans you can check out, or share your own if you have one!